Sometimes out of the blue I'll get an idea for my next painting. The more surreal the better in my mind. It's important that I write my idea down quickly or it'll be lost, like that good dream you had last night that you just can't remember. However I hate having scraps of paper lying around so I email myself the idea instead, which saves paper and ensures I always know where to look for them. 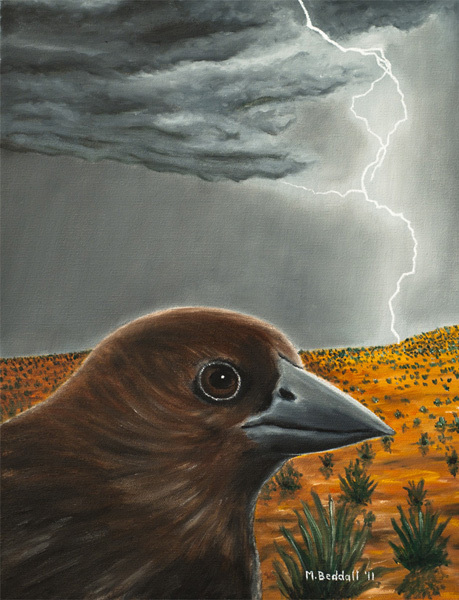 I have no idea what the inspiration for this painting was, just that I liked the idea of a close up of a bird with some violent weather in the background. Actually I think I'll make this my next series. Stay tuned.